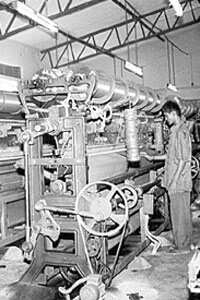 A textile unit in Karur, Tamil Nadu. New Delhi: India’s smaller exporters are putting their investment plans on hold in the wake of the sharp appreciation of the rupee against the dollar, which has eroded their cost competitiveness in the global market. G.K. Gupta, president, Fieo, said at a press conference that members have seen an erosion of 8-9% of profits this year on account of the rupee’s appreciation. The erosion of profits and competitiveness have triggered suspension of investment plans. “The rate of appreciation is the problem," Gupta added. The rupee has appreciated 11.4% against the dollar this year, the sharpest among Asian currencies; other Asian countries are India’s dominant competitors in its traditional exports such as leather, textiles and handicraft. The Indian currency touched Rs39.62 to the dollar on 26 September, the highest level since April 1998. It closed at Rs39.85 to the dollar on Monday. The impact of a slowdown in investment by exporters on the overall economic growth is difficult to assess at this moment. “After March 2004, there’s been a structural shift in the economy, which makes it difficult to calculate the impact," said Chakraborty. The economic growth in the first quarter of 2007-08 was 9.3%, marginally lower than the 9.4% rate in 2006-07. M. Rafeeque Ahmed, chairman of Farida Group, which exports leather footwear, said that the group has put on hold plans to increase its capacity from the current 25,000 units a day to 40,000 units on account of the rupee’s appreciation. Initially, the group planned to add this capacity by May 2008, added Ahmed. Tirupur in Tamil Nadu, home to several textile exporters, has been adversely affected by the recent events. According to A. Sakthivel, a Tirupur-based entrepreneur and vice-president and chairman of Fieo’s southern region, companies in the town have begun to suspend expansion plans. The town has also begun to see lay-offs in the wake of the rupee appreciation as some companies have been unable to cope with the situation. About 7,000-8,000 people of Tirupur’s total workforce of 400,000 were laid off recently, said Sakthivel. The rupee’s appreciation has begun to show up in the form of a slowdown in overall export growth. According to the Reserve Bank of India, merchandise exports in the first quarter of 2007-08 grew by 17.1%, compared with 23.7% in the same period in 2006-07. Trade data for April-August period released by the commerce ministry on Monday showed that exports grew 18.36% year-on-year to $59.48 billion. Fieo has suggested that the government adopted a mix of measures to mitigate the impact of the rupee’s appreciation on exporters. Its suggestions include monetary measures to reduce interest rates, administrative measures to reduce working capital needs of exporters and creating an institutional mechanism in the form of a high-level committee to identify long-term solutions to the problem.